The Paris CDG - Tokyo Haneda flight with JAL took off early evening. This is an ideal night time flight time that arrives in Tokyo mid-afternoon. 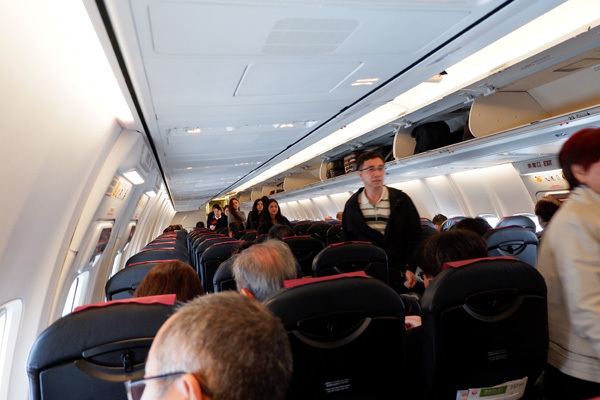 On board, the staff was attentive and caring. Everything went very well. The meals served on board were very good. 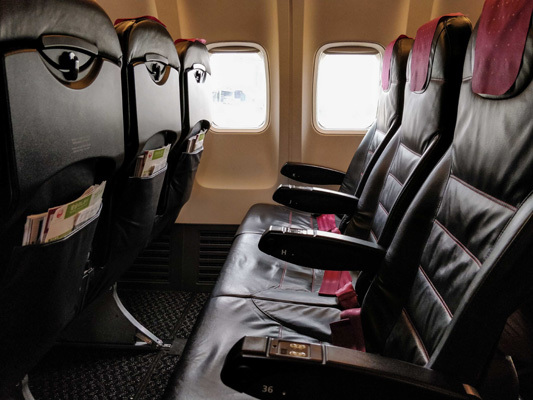 The seats and space for each passenger is comfortable. 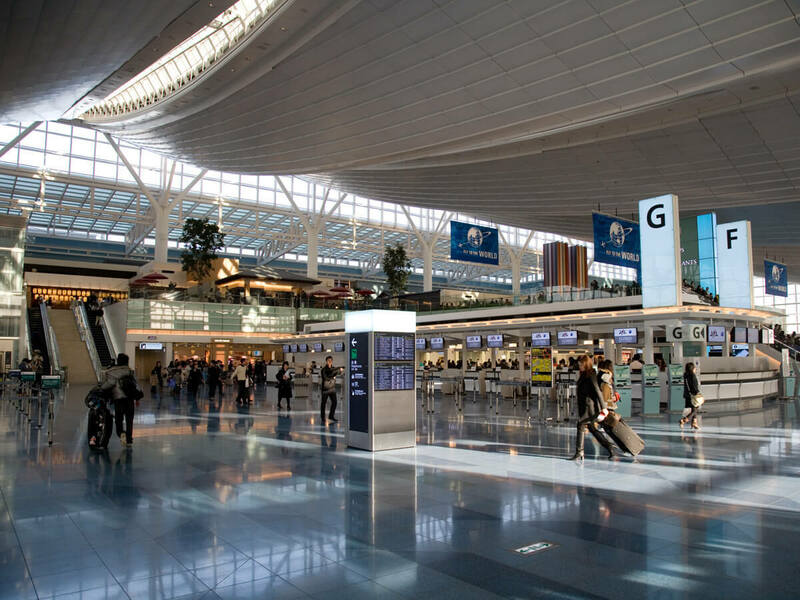 Haneda Airport is well located, fast to get to Tokyo. 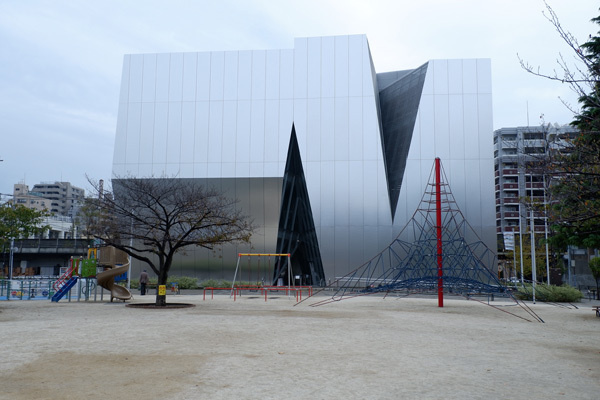 Opened 2 years ago in the Ryogoku district, the museum is dedicated to one of Japan's most famous painters: Katsushika Hokusai. 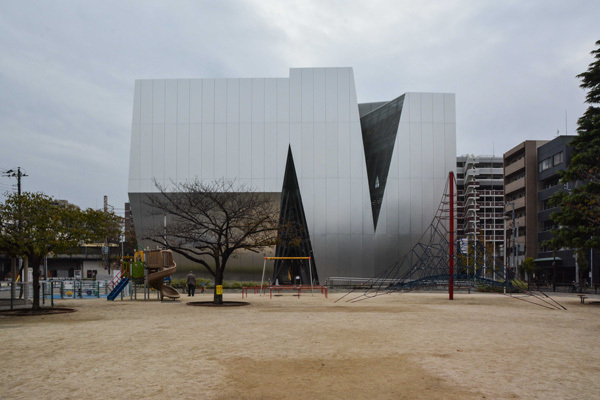 The four-storey museum was designed by Sejima Kazuyo, one of the founders of the Japanese architectural firm SANAA. 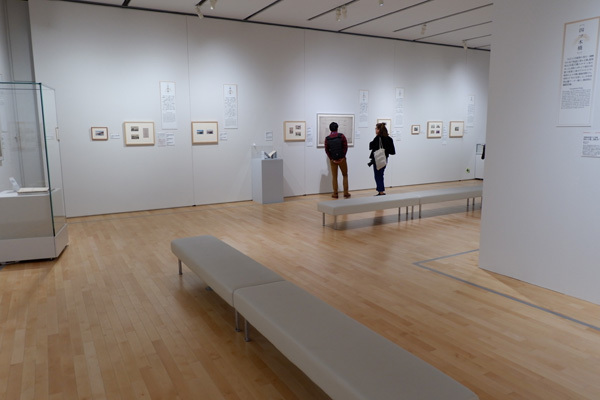 The permanent exhibition on the 4th floor takes us into a beautiful, subdued space that includes beautiful prints and information about Hokusai and his disciples. 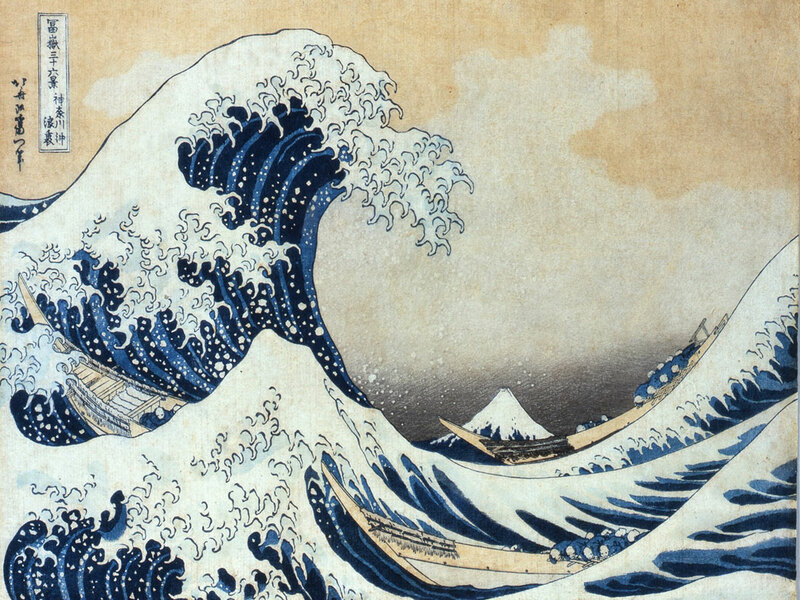 We were able to see a temporary exhibition on bridges in Hokusai's work. 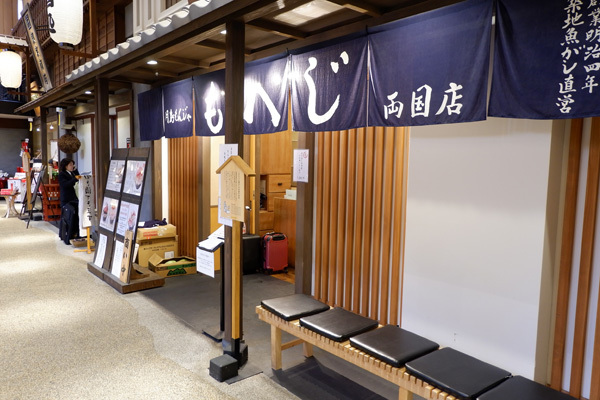 Not far from this museum, at Ryogoku station, the Ryogoku Edo Noren complex recalls the atmosphere of the Edo era. 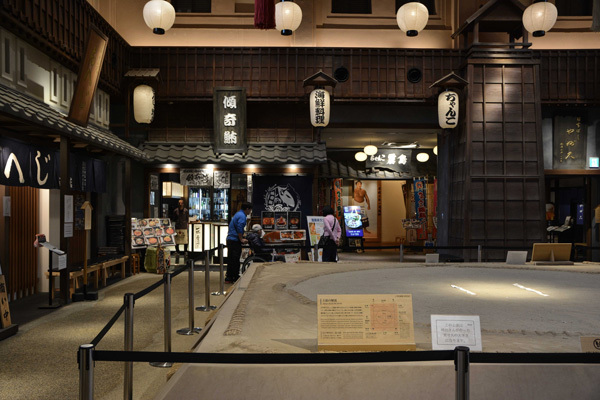 There are cafes, bars and restaurants as well as a sumo arena. 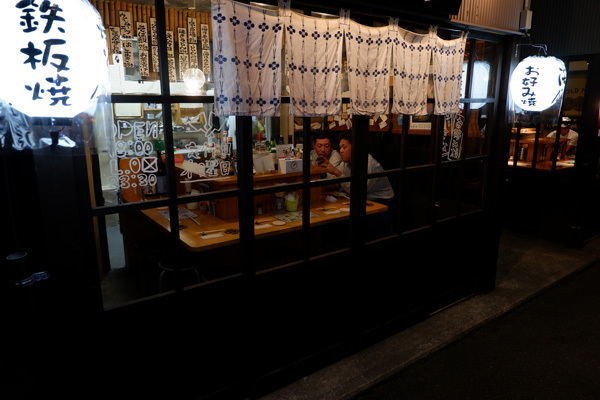 We ate at Tsukishima Monja Moheji, a restaurant specializing in monjayaki, a typical Tokyo dish. The ingredients (cabbage, carrots, vegetables, meat, fish, shrimp, mochi, cheese....you choose!) 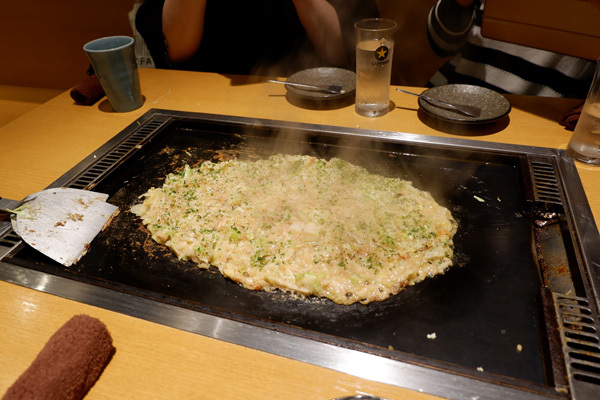 are finely chopped and mixed with the dough, all fried on the hot plate located in the center of the table (teppan). 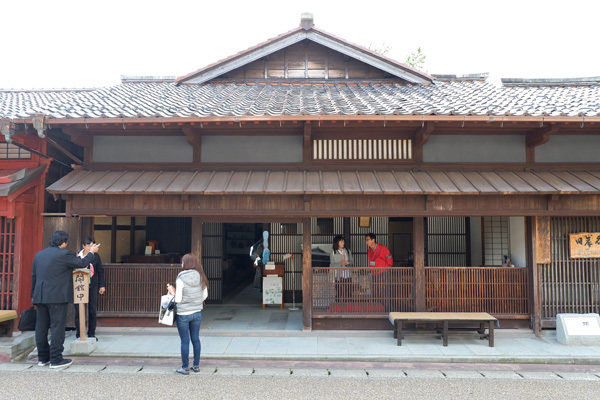 This was my first visit to this museum dedicated to the works of this famous Japanese painter of the Edo period. 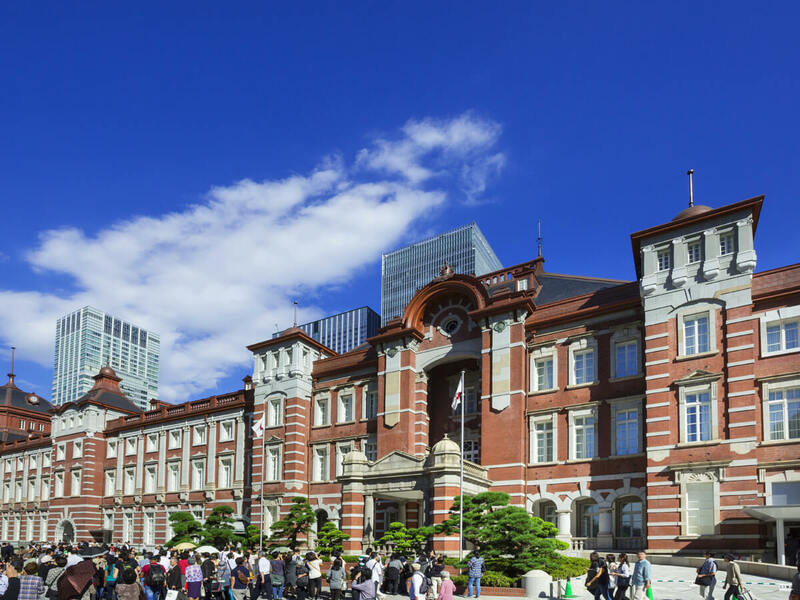 It is located in the Ryogoku district, known for the Kokugikan and the Edo Museum. 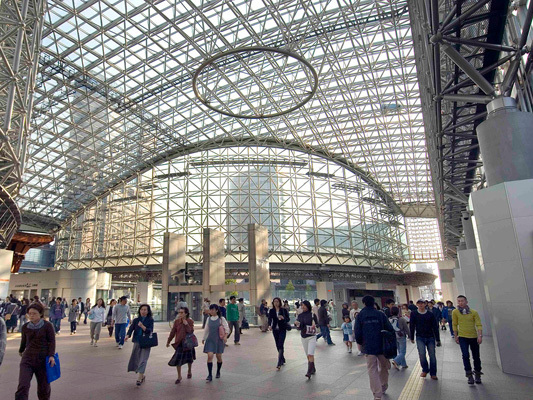 The surprise begins as soon as enter the street, when you discover a building with an intriguing shape. Inside the remarkably bright interior are several galleries, of reasonable size and not requiring too much time. Explanations are provided in Japanese and English. It was therefore a lovely discovery and a pleasure to immerse myself in the immortalized moments of what Japan was like during its total isolation from foreign countries. A shopping centre inspired by the city of Edo, which includes a few restaurants, and a Sumo arena at its centre. 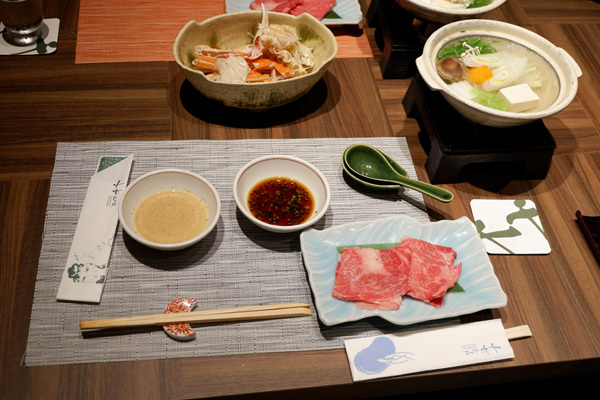 The atmosphere of the restaurant was excellent and the monjayaki were cooked directly on the table. 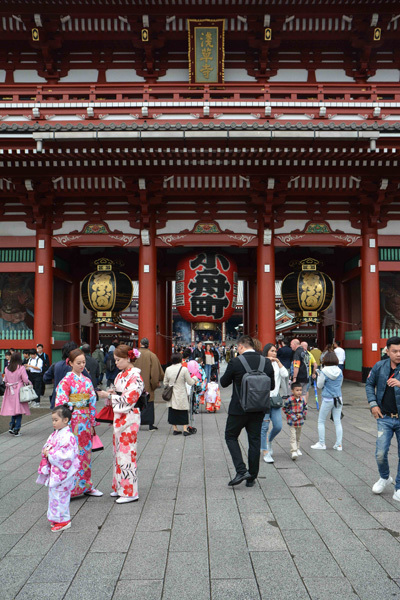 The Asakusa district remains a historical district but with a mix of modernity embraced since the construction of the Skytree Tower with low houses, old shops, wide avenues. Feel free to go up to the top floor of the tourist information centre: the view is breathtaking! 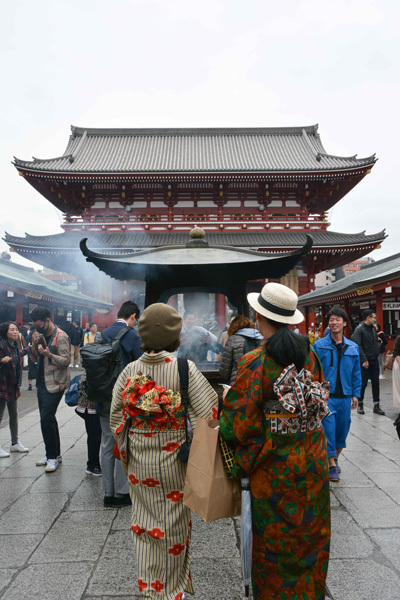 Senso-ji is the oldest temple in the capital dedicated to Kannon. 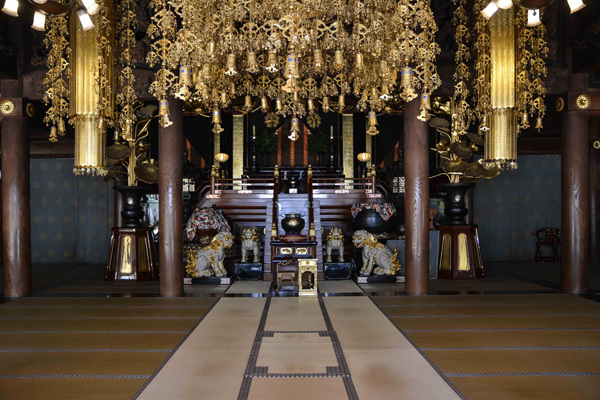 It remains a place of worship for pilgrims and Sumo wrestlers who come to pray before their fights. A lot of people, but that's the only way to see the temple. Even though I know this area well, it is always a pleasure to visit it again. On Asakusa you can find a shop selling Japanese dishes made of composite, those you can usually find in the front of restaurants. It is nice to see a shop that offers these replicas at all kind of prices. 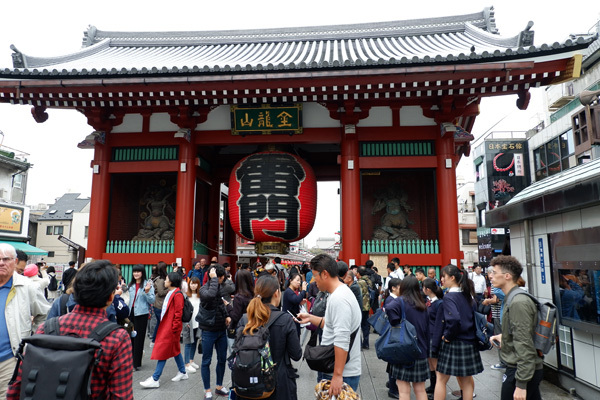 Before starting the visit of the district, it is worth climbing to the top of the building of the tourist office located just opposite Kaminarimon to enjoy the general view of Asakusa. 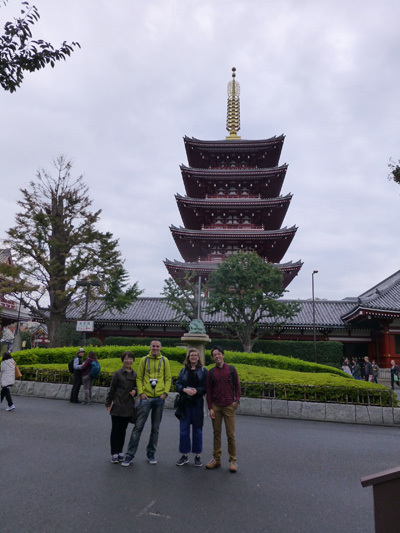 After the meal, we moved to the very famous district of Asakusa, which I like very much for its very lively streets with a retro atmosphere. 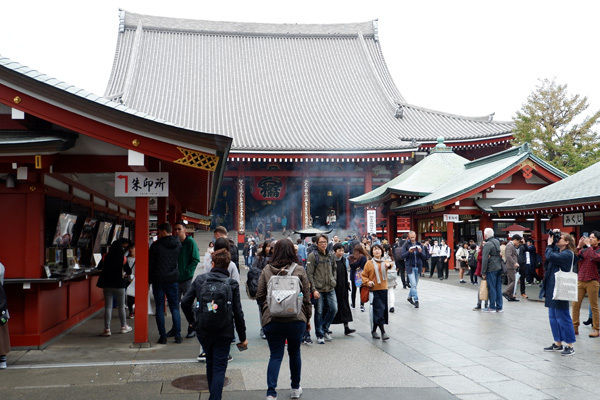 The highlight being the very famous Senso-ji Buddhist temple, dedicated to the goddess Kannon. The construction of the various buildings is impressive by its size, its sparkling red colour. 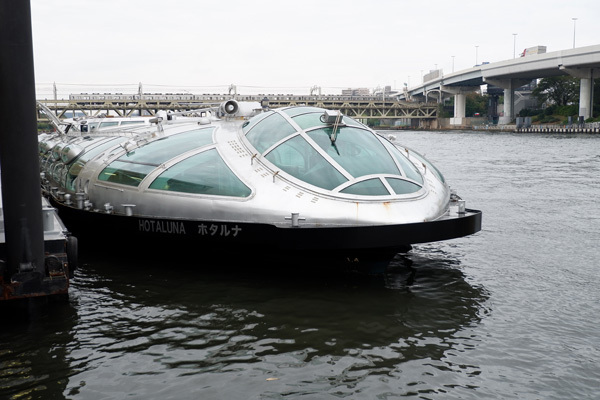 This one-hour cruise from Asakusa to Odaiba on board the futuristic boat imagined by a Japanese designer allows you to see Tokyo in a different way: from the Sumida River. On the boat, there is all the necessary comfort to enjoy this moment: bar. I boarded Hotaluna, a boat whose design was based on a concept by a famous Japanese manga illustrator. 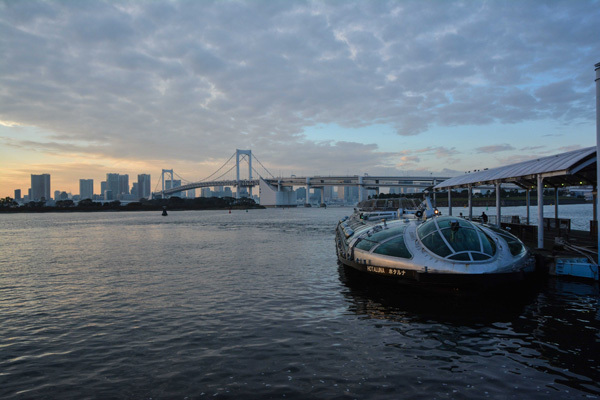 The route of this boat connects Asakusa to Odaiba, it also travels on the Sumida River and in Tokyo Bay. 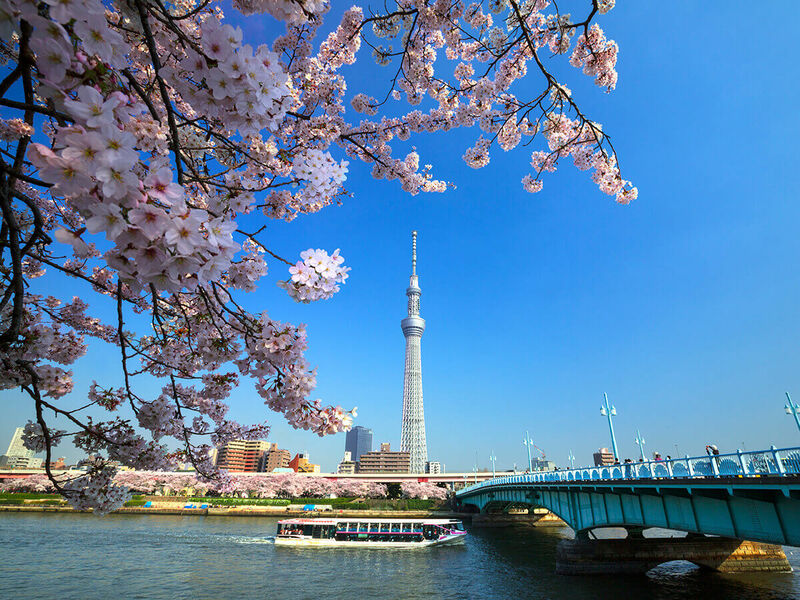 It is certainly very interesting for people who want to visit Tokyo from a new angle, from the river, which allows them to enjoy the landscapes that surround the boat. Even at night, we were able to enjoy this garden thanks to stunning lighting. A beautiful pond, beautiful traditional houses, old bonsai, maples and cherry trees: the perfect mix for a traditional Japanese garden. I wish one day to be able to visit this garden in broad daylight too! 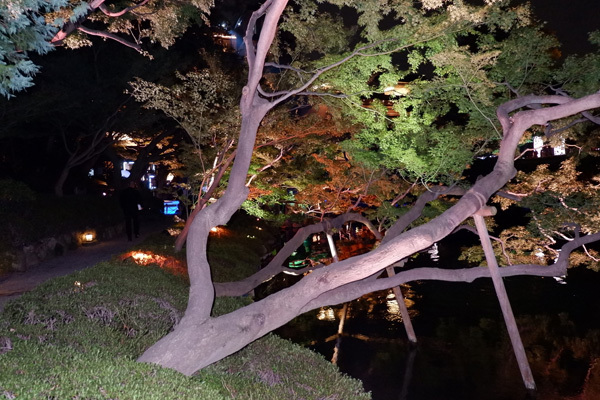 The dinner that followed was held at Enjyu Restaurant in Happo-En Garden. 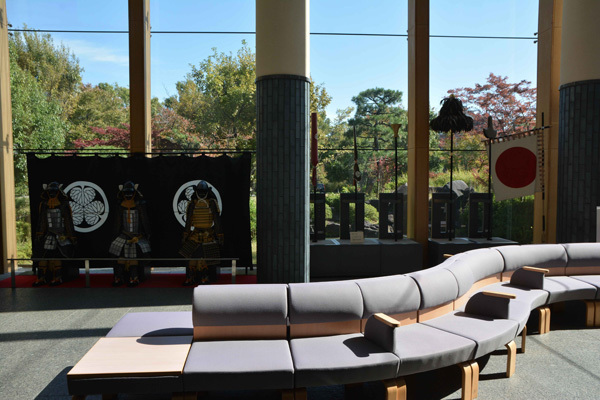 Large bay windows overlooking the romantic garden allow you to enjoy the view while enjoying excellent traditional Japanese cuisine served in beautiful dishes. A beautiful setting for a successful evening! 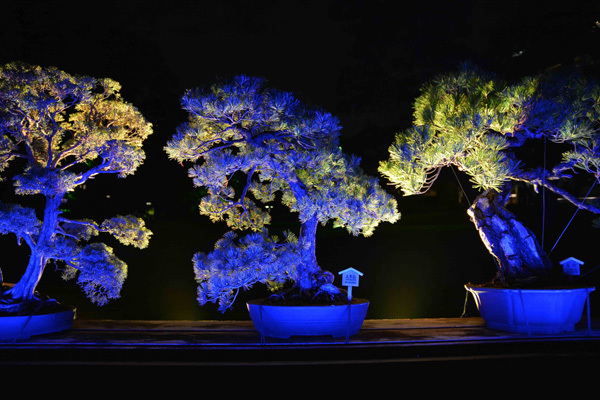 The Japanese Happo-en garden is stunning at night thanks to very beautiful lighting. There is also a beautiful collection of bonsai trees, some of which are even centenarians! Japanese dishes were served to us as we progressed through the evening. It was truly exquisite. 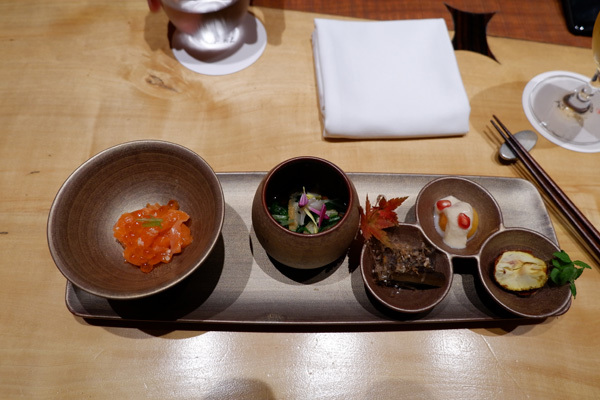 The one thing I particularly appreciated was the fact that I was able to take advantage of a unique opportunity to observe the garden while enjoying a refined cuisine. 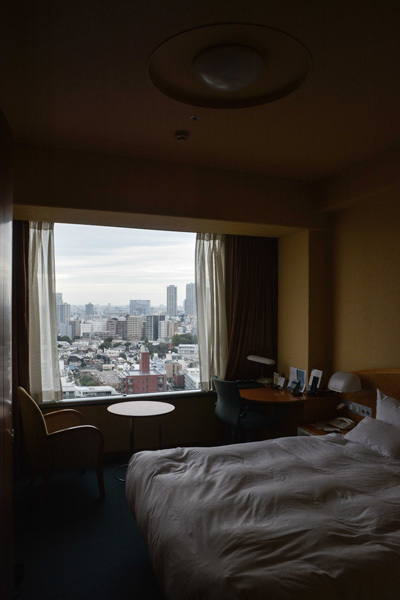 Shinagawa Prince Hotel is equipped with all the necessary comforts, each room offers a magnificent view of Tokyo, the hotel is close to Shinagawa Station, allowing you to use the Shinkansen, the Japanese high-speed train, or the Yamanote line, for example. 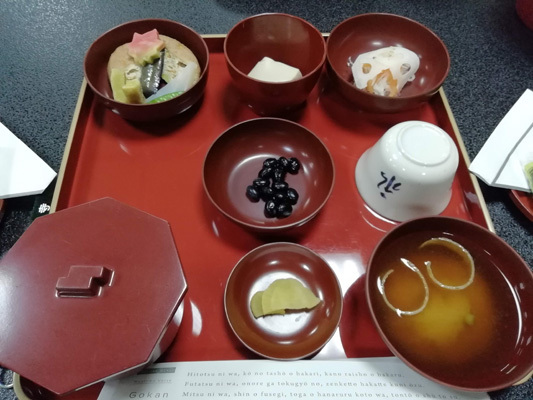 In the secondary building that I used, breakfast was served as a buffet of Japanese or Western cuisine in a refined atmosphere. The room was clean and comfortable. 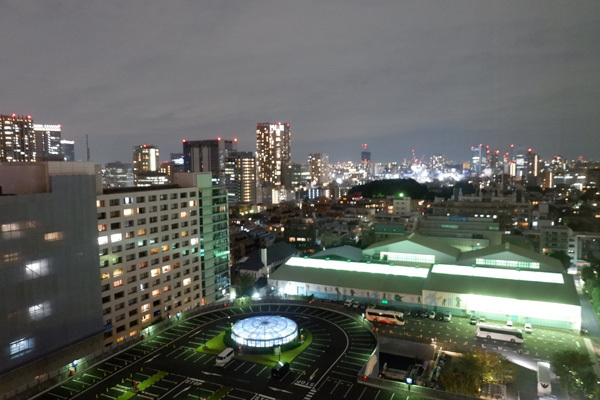 The view of Tokyo by night from this hotel is breathtaking. Breakfast is served at your choice in one of the various restaurants in this complex. I chose a buffet that allowed me to go and help myself to as much as I wanted of the dishes I liked. 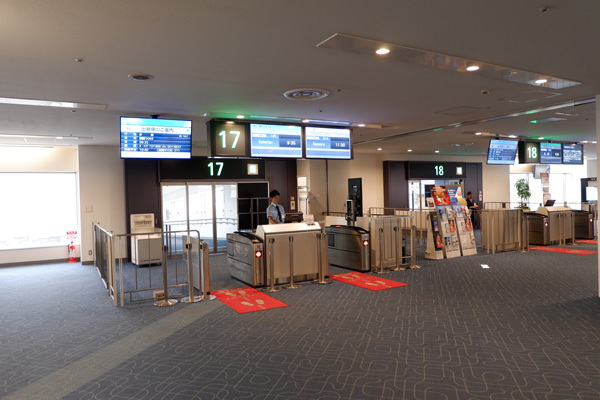 The Tokyo Haneda - Komatsu domestic flight only lasts one hour and is very convenient for travelling to Fukui Prefecture. 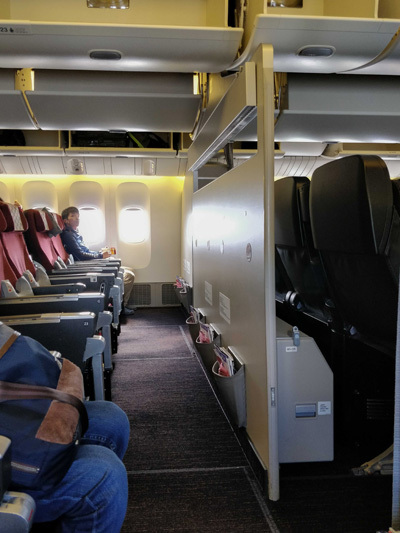 On board, Japan Airlines' service and comfort are on par with its reputation: attentive and discreet flight attendants, comfortable seats... The plane left on time. The flight was pleasant and left on time. All the crew members were smiling, it was pleasant. On board we were offered a drink just after takeoff. We reached our destination in less than 50 minutes where a warm welcome awaited us. 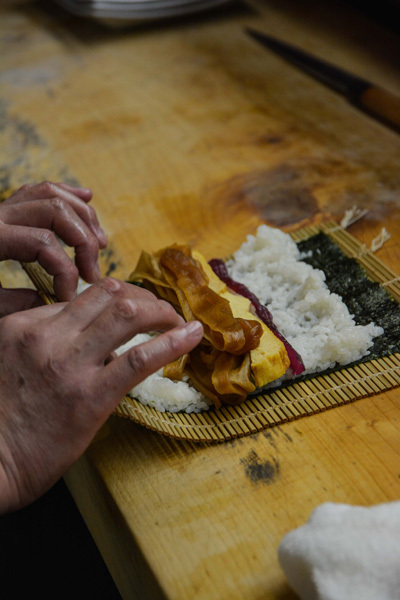 The Hatsumi Zushi Honten restaurant located in the city of Fukui is renowned for its sushi, a very prevalent dish in this region due to its geographical location near the Sea of Japan. 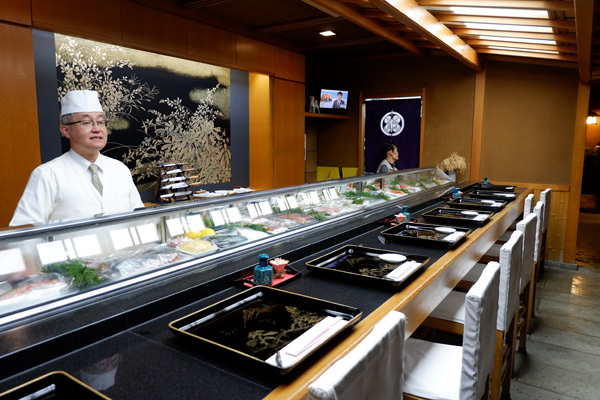 Once behind the noren, we sat down at the long counter to enjoy sushi prepared before our eyes by the master sushi chef. We were able to go behind the counter to learn how to make maki, then had the privilege of going into the kitchen to see how the chef made the broth for his soup, which was as tasty as it was beautiful. 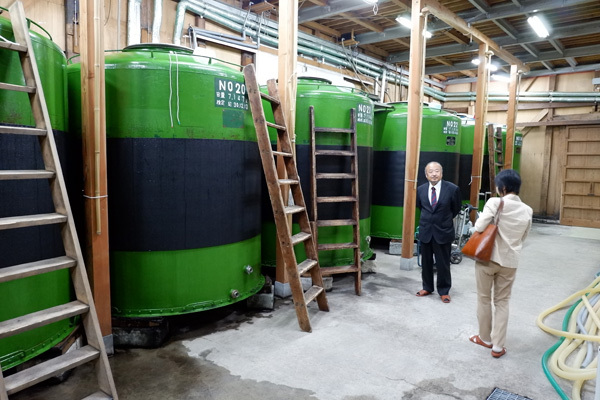 We were welcomed by the director of the Kubota family's microbrewery, 11th of his generation. 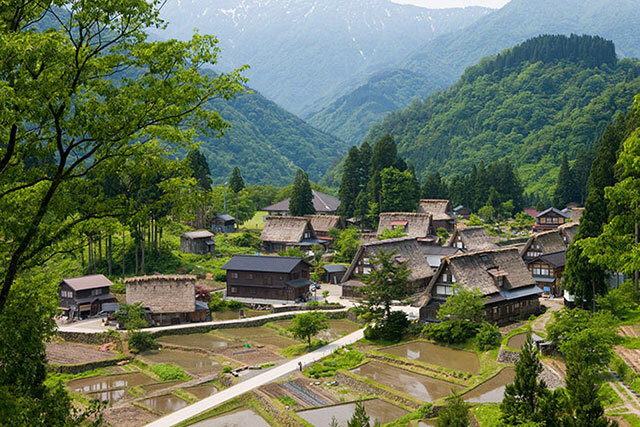 The brewery has two particular features: they grow their own rice and make their sake from local water pumped 200 metres underground. Once we completed the visit explaining the whole sake making process, we were able to taste the different sake produced by this brewery. 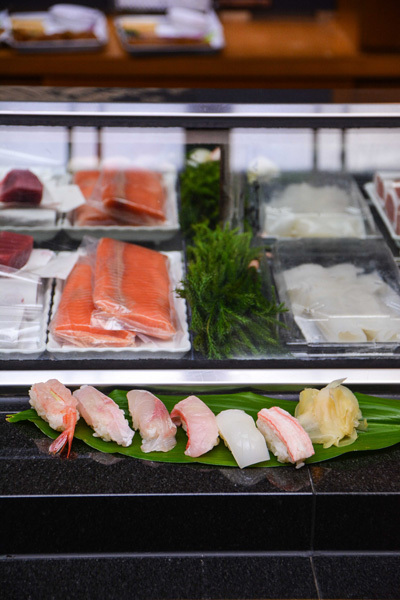 We were invited to have lunch at the Hatsumi Sushi Hoten restaurant, a beautiful and authentic little family restaurant that offered us a delicious sushi menu. Then, the chef invited us behind the counter and demonstrated how to make maki rolls before giving us the opportunity to make one ourselves. 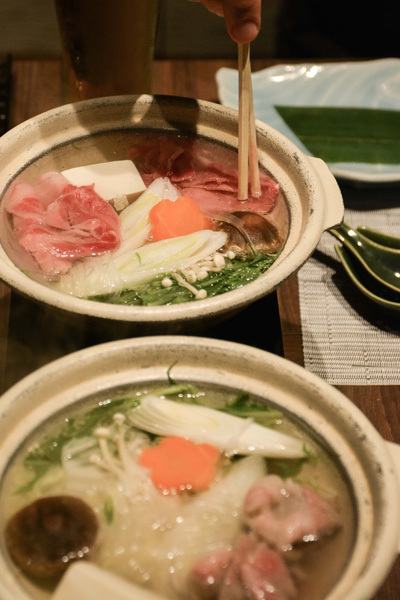 He also invited us to his kitchen to show us how to prepare his homemade broth to accompany the maki tasting. Throughout the meal, we had a very good time with all the staff who welcomed us warmly. 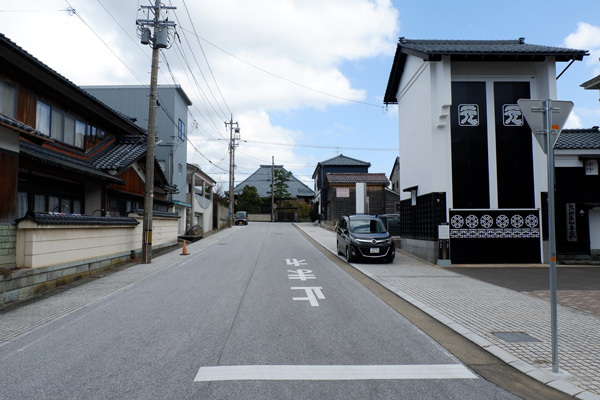 The Sake Kubota's Brewery in Fukui has been in operation since the Edo era. 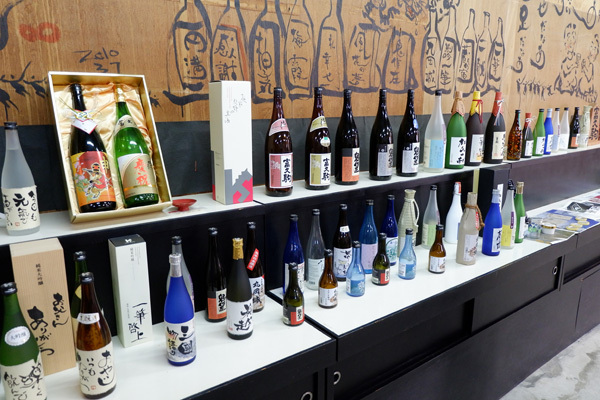 We received explanations about the various sake making processes and we were taught some secrets about the special flavour of the sake from the Kubota Brewery. The visit was followed by a tasting in the shop area. *Generally only operates on weekdays, but check in advance for any cancellations. Tojinbo is a scenic spot where the cliffs continue to be roughly cut by ocean waves. 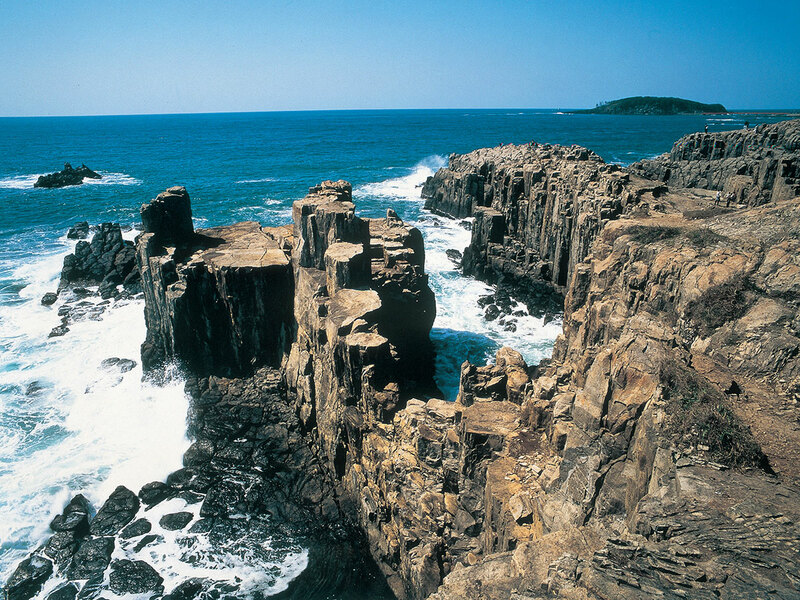 The spectacular cliffs of Tojinbo extend for about 1 km along the coast of the town of Mikuni. 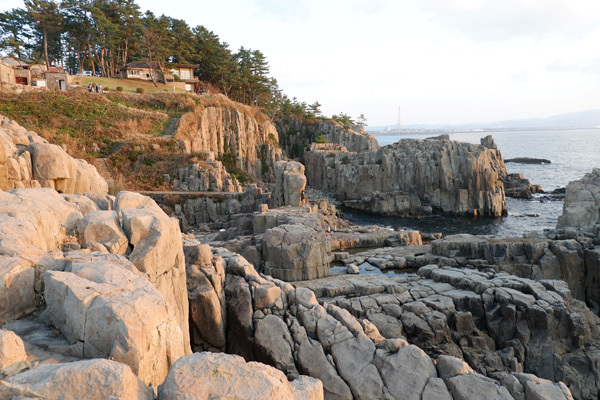 Called pyroxene andesite columnar joints, the cliffs are said to be geologically rare rocks that are found in only three locations in the world, including Tojinbo, and have been designated a natural monument of Japan. You can also enjoy the scenery from 55 m above in Tojinbo tower or from a pleasure boat cruise around the cliffs. 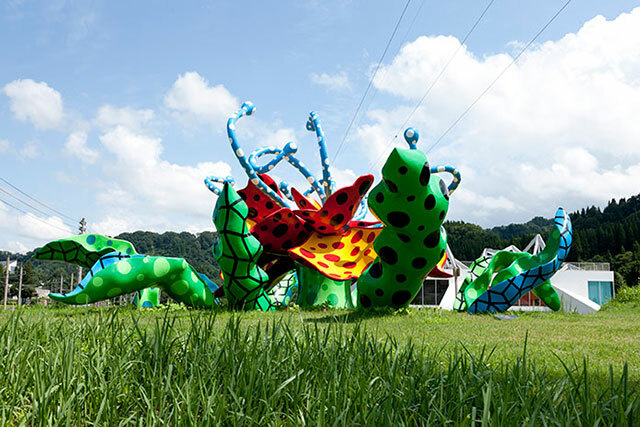 This is THE must-see site in the Fukui region I was very much looking forward to. I was not disappointed. 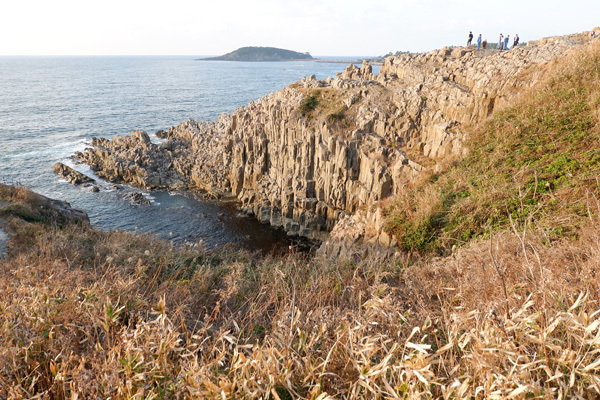 The site is outstanding: successive cliffs overlook the Sea of Japan over more than 1km. A rather rare natural landscape because the rocks are a very geometric type of basalt sticks. 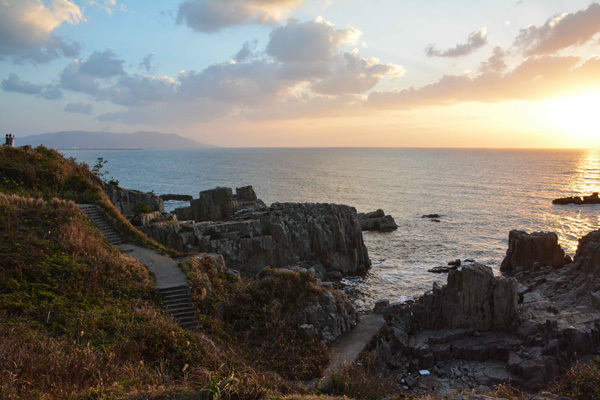 We were able to observe the landscape until sunset when many Japanese people like to gather there. The arrangement of the basalt columns with their regular geometric shapes creates an attractive landscape. It simply is an unbelievable place where I enjoyed the sunset. In fact, this place is famous for its sunsets. The sunset light caressing the rocks and the steep coastline is ideal for those looking to capture these moments in beautiful photos. Awara Onsen has a pleasant seaside resort but it is also a tourist site. So we were able to test the hotel's onsen to relax after a long day of visiting. The waters here are helpful for rheumatism and dermatitis. That day, I stayed in the ryokan, the Japanese inn, "Matsuya Sensen" which is located in Awara Onsen. 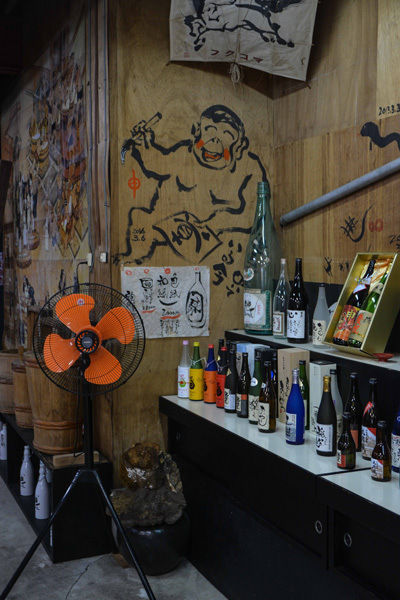 Easily accessible from the hotel, Yataimura Yukemuri Yokocho is an avenue of typical Japanese micro restaurants such as ramen or soba. Each stall can only accommodate 10 people. Right next to the yokocho, there is a free public footbath. 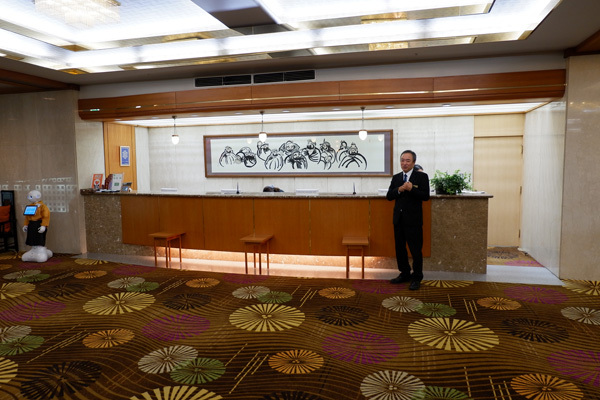 Matuya Sensen Hotel offers traditional Japanese accommodation. 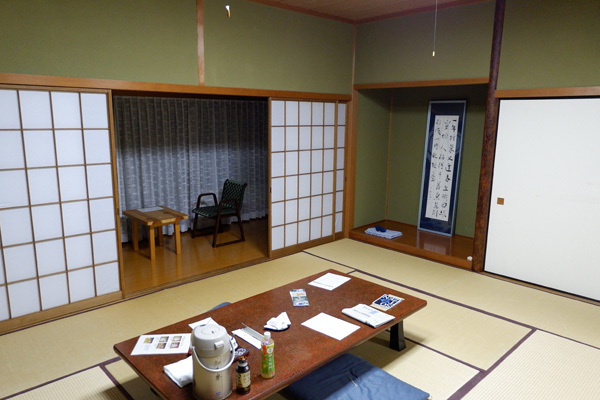 Before reaching our room, we were able to enjoy a matcha tea as a welcome drink in a tea house. 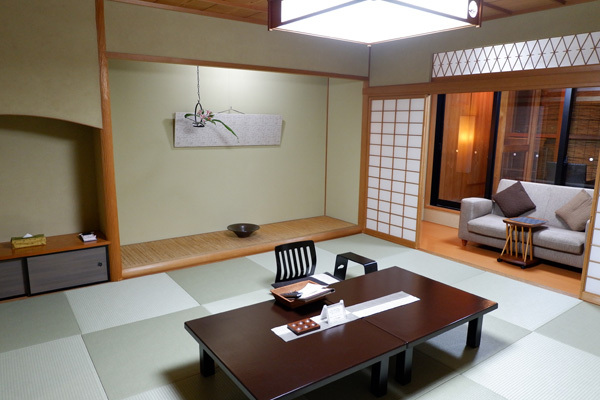 I loved the Japanese style room with large spaces and tatamis on the floor. 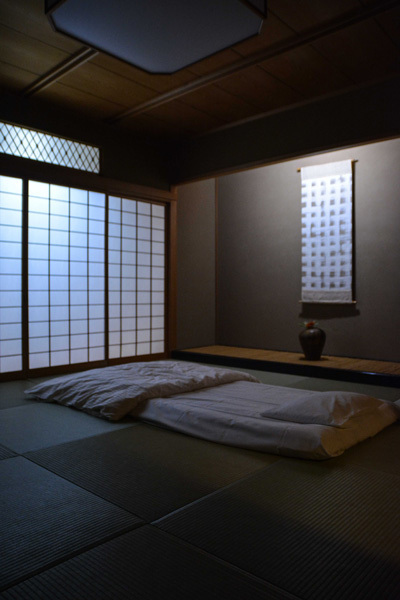 The room also had a small onsen on its terrace. 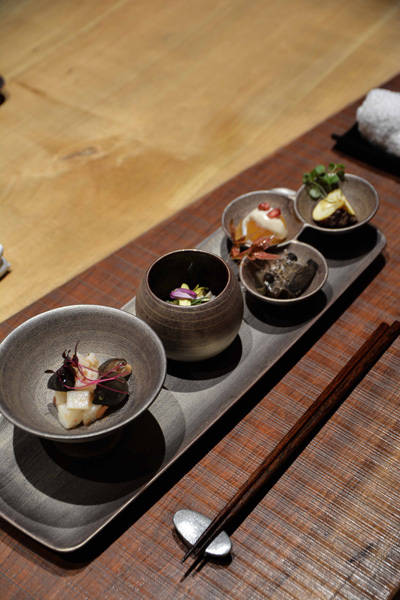 In Matsuya Sensen's restaurant, both the kitchen and service were tasteful. 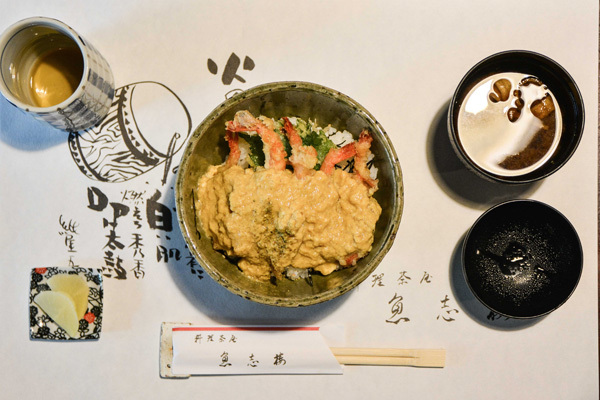 Refined dishes including the region's famous crab. The smiling staff gave us all the information about the dishes we didn't know. I can only congratulate this establishment for this stay. A small alleyway with a few micro-restaurants grouped in a tiny alley. 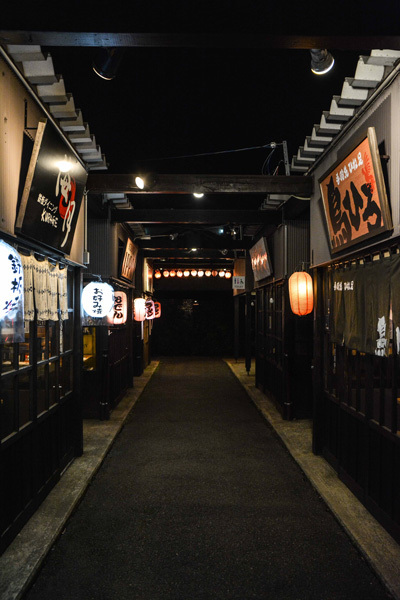 The place is well lit, located in front of Awarayunomachi station, where you can enjoy typical Japanese dishes at very reasonable prices. 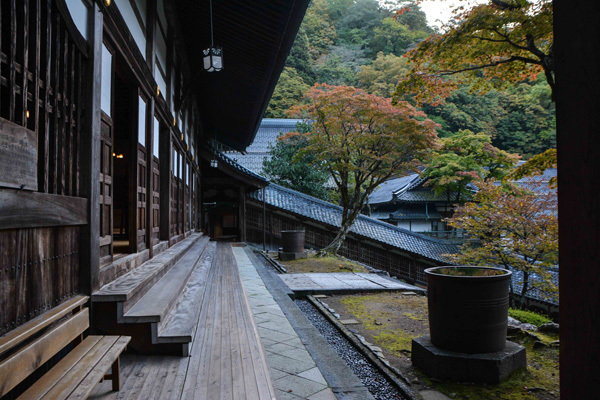 The ryokan is very big, all the rooms are in Japanese style and there are famous natural thermal baths. 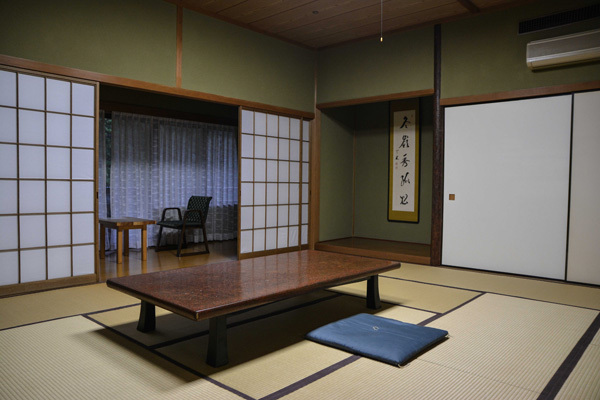 First of all, the ryokan was presented to me in French and then I immediately enjoyed a cup of matcha tea in a small room with a traditional atmosphere. Each room features an outdoor thermal bath called "Rotenburo" on its balcony. 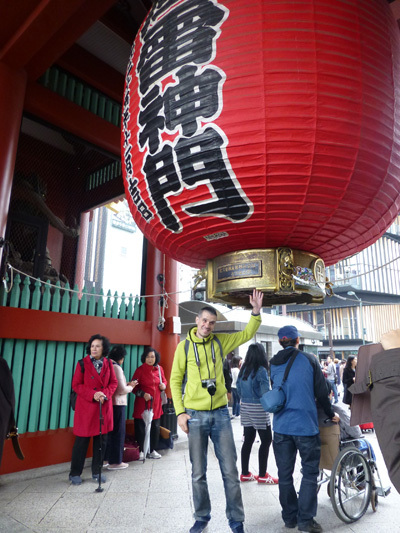 I loved visiting the city of Mikuni Minato and its main street. 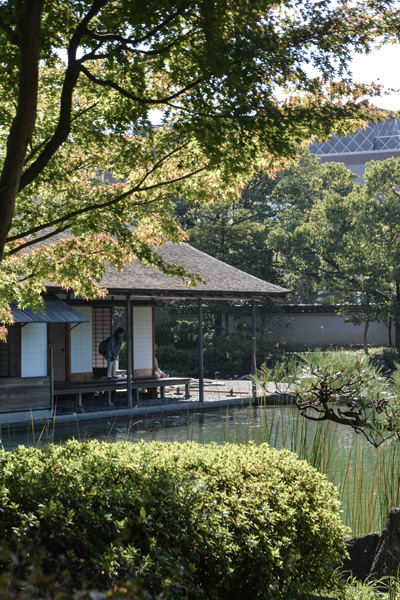 This city has flourished for centuries as a port of call for ships from the Sea of Japan. With its lattice townhouses, merchant and samurai residences, it is easy to imagine the vibrancy of the city at its height. The beautiful Kishina merchant house that flourished in the woods is worth a visit. 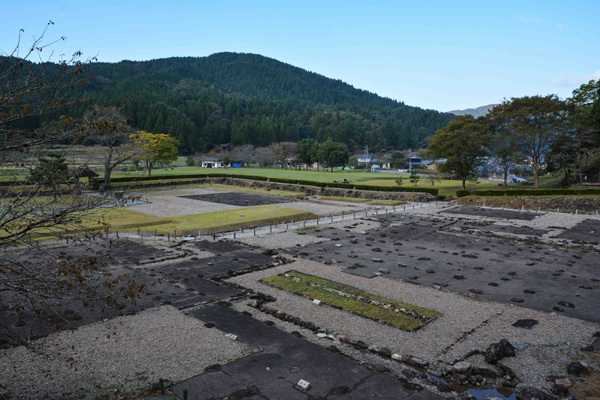 These are the historical ruins of the Ichijôdani Asakura family that dominated the Echizen region. This was my first time visiting ruins in Japan. 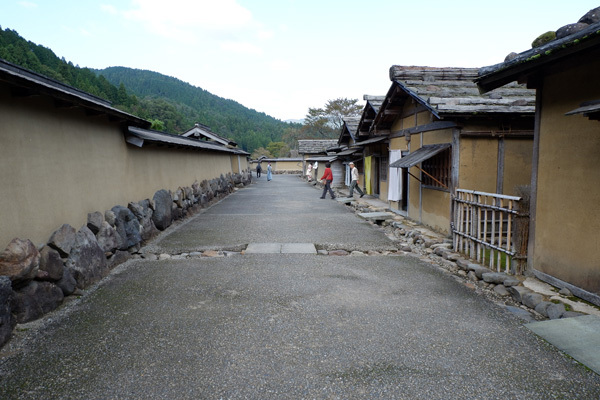 We were able to discover part of this period in history, with restored samurai dwellings along the earthen walls, along with merchant houses, townhouses, an owner's house and a dyer's shop. I had a great day walking around this quiet city. In the morning, I went around the city of Mikuni. 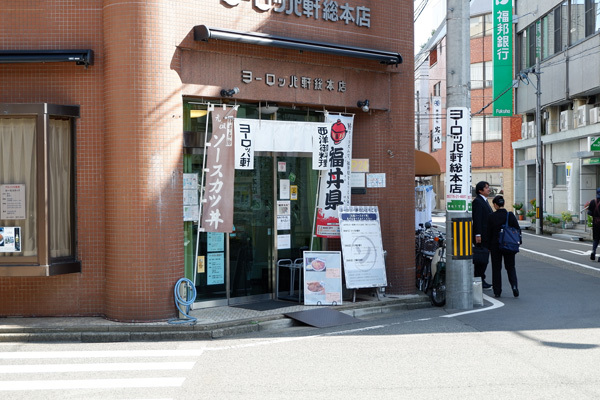 I saw the "old Morita Bank" which was built about a century ago following Western standards, and I also walked through the small surrounding alleys. I was able to visit a unique warehouse where huge warrior floats (6 metres high) are kept. I had lunch in a local restaurant, "Uoshiro", located by the sea. 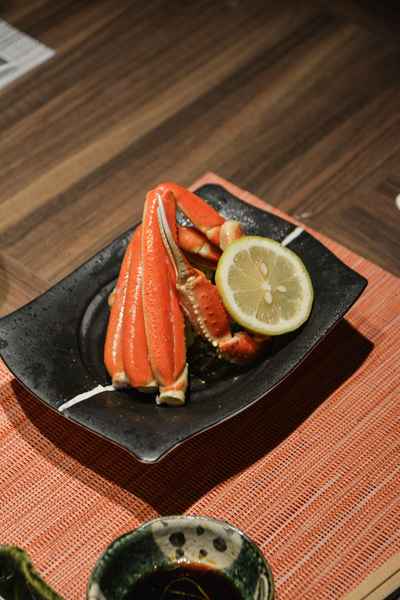 In a nostalgic atmosphere of yesteryear, delicious dishes based on fish and seafood are served. 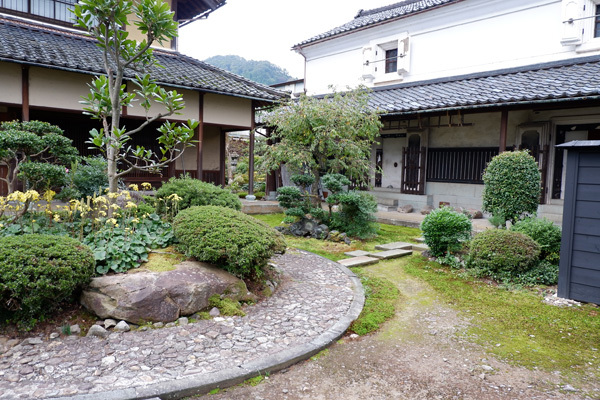 I discovered the historical ruins of the Ichijodani Asakura family, a place steeped in history. Stepping through the entrance, you take a leap back in time. The dwellings and alleys are as they were back then, with the added bonus of a few staff wearing period costumes. 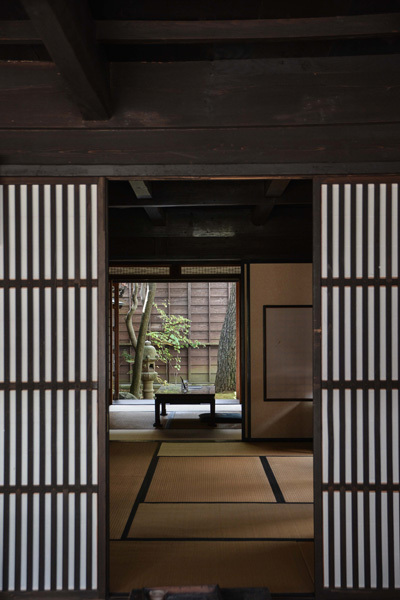 Both the interior and the exterior of the houses also benefited from careful restoration, reflecting the way life was at the time. 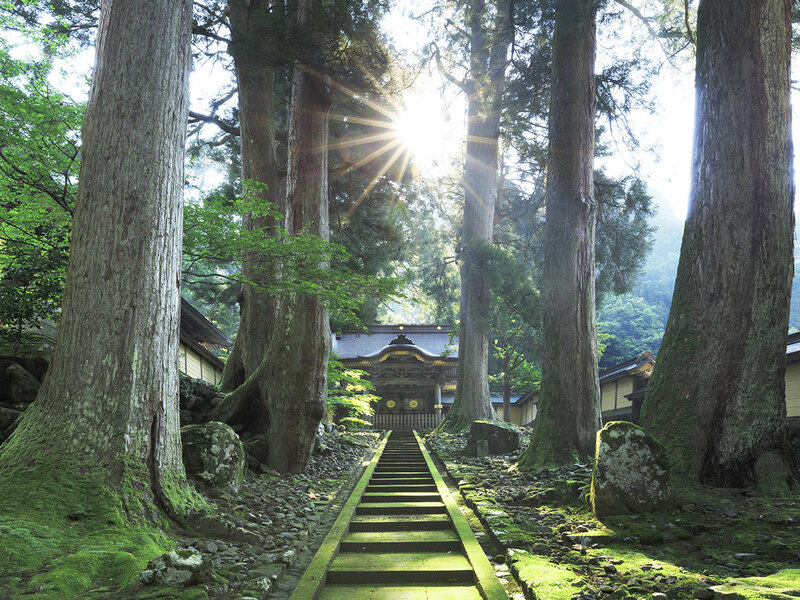 The temple of eternal peace is one of the two main temples of Soto Zen. It is located in an exceptional location, on a mountainside, surrounded by hundred-year-old cedars. The Shukubo, which means sleeping with the monks, takes on its full meaning here: discovering the monks' daily life, learning about shojin ryori vegetarian cuisine, attending religious rituals very early in the morning and learning about zazen twice a day: one of my most powerful experiences in Japan! The dinner at the zazen temple was a real experience. 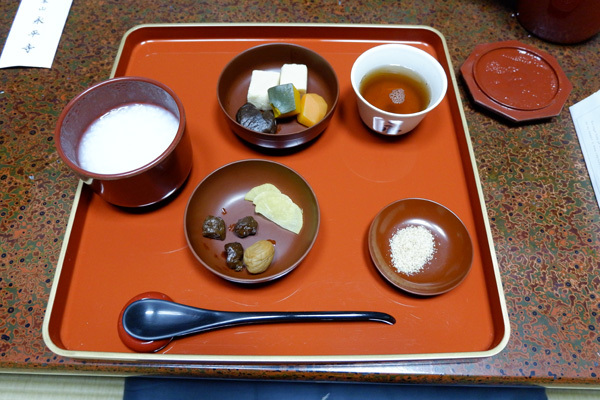 This was an opportunity to taste the monks' cuisine: shojin ryori, a purely vegetarian cuisine. 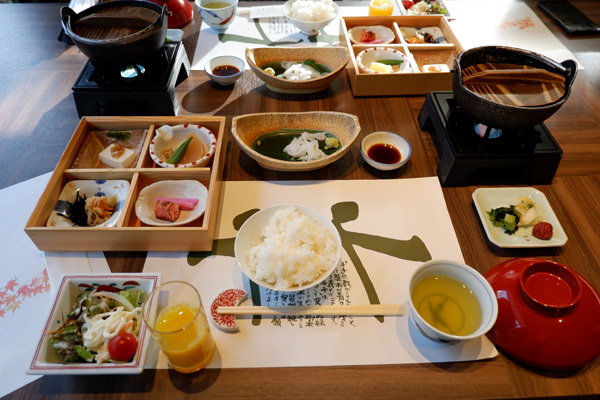 Meals are ritualized in the zazen culture. They must be taken in silence. Then, you have to pay attention to others because all must finish their meals at the same time. Fortunately, all this was explained to us in English by a monk from the temple. The room I slept in was very large. 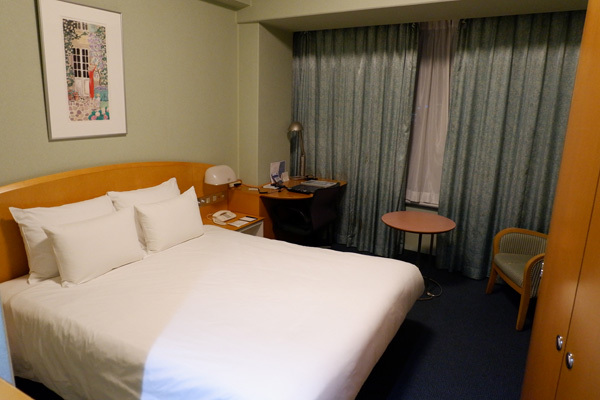 I didn't expect such comfort: large room, bedroom with futon, water and sanitation. The baths are taken in the basement in the sento. We were served our breakfast in the room. We used the same sticks from the day before, once again so as not to waste them, once again in silence. 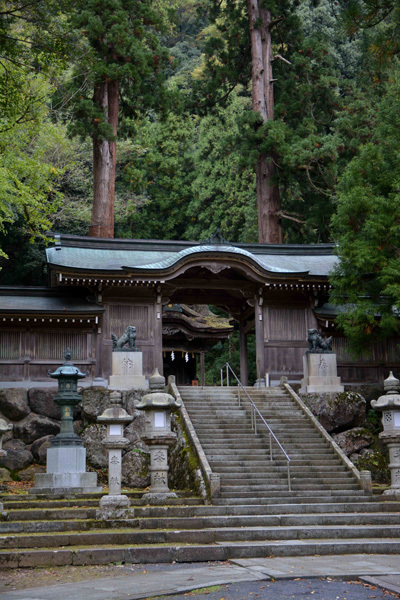 The Eiheiji temple was a true experience for me. It is simply magnificent, of a beauty I have rarely seen. But there is more to it than that, this place, a Zen cult center founded by Dogen, a 13th century Japanese monk, treated me to a unique meditation experience following the tradition of the Soto (Zen) school. Early morning, we attended a series of prayers in the main building, very impressive when all the monks were gathered there. Dinner at the monastery is an unusual experience. 2 small altars to pray and thank the gods for the meals are located in the dining room, then we all ate at a similar pace in order to manage to finish more or less all at the same time. Of course, no words were spoken during the meal, taking place in absolute silence. 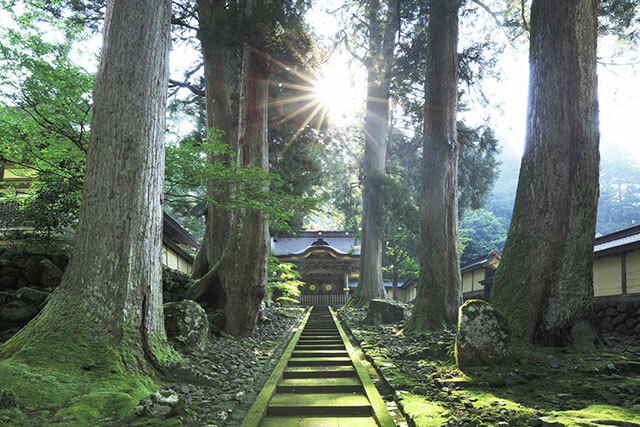 We slept on tatami, on a futon on the ground, that you must store yourself in the morning and thus participate in the efforts of this monastery life. 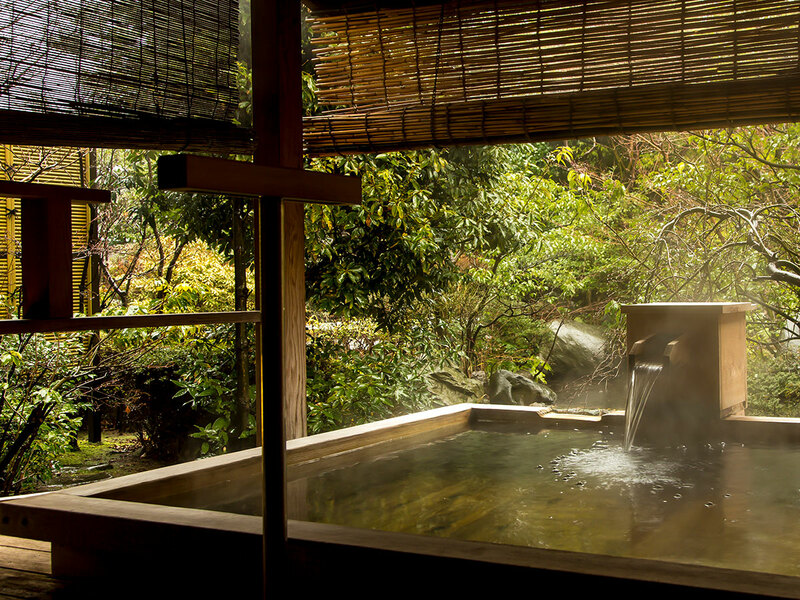 There are shared traditional Japanese thermal baths. The dishes are vegetarian, you have to eat in silence and without wasting anything. 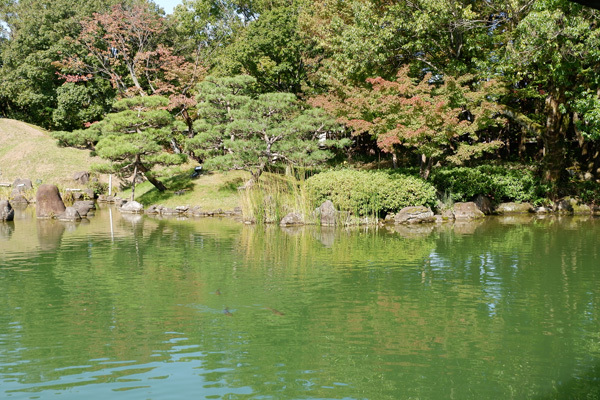 The picturesque garden of Fukui, where the former home of the Matsudaira family stands, has a beautifully restored tea house overlooking the pond, where you can sit and contemplate the immensity of the garden and its many carps. 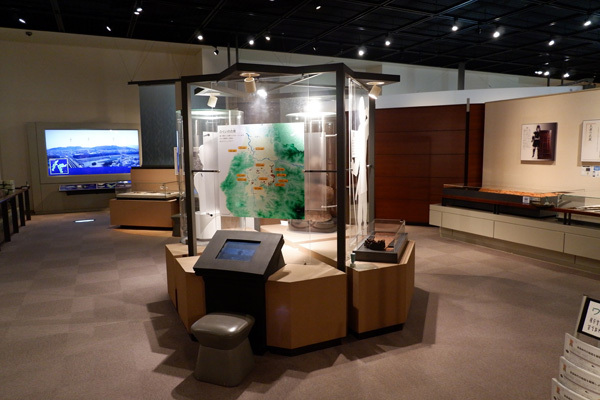 This museum retraces the history of the city of Fukui from prehistory to the post-war period, including the destruction of a large part of the city following the Second World War and a major earthquake. 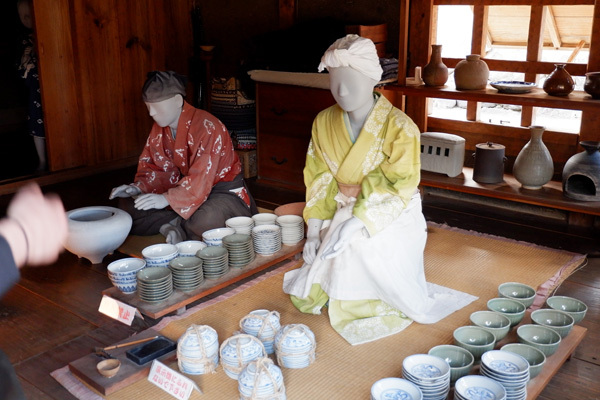 Upstairs you can also discover objects from the Edo period as well as beautiful costumes. 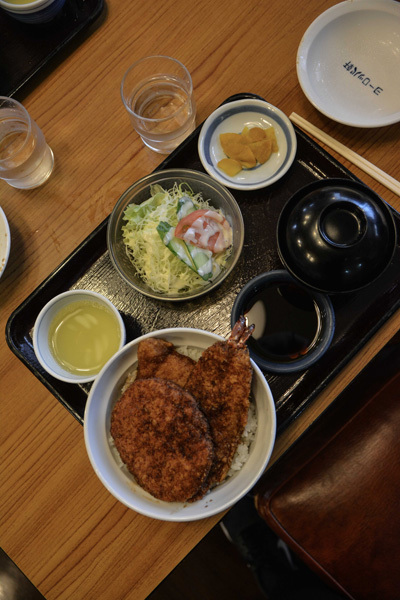 Yoroppaken, a very famous Katsudon restaurant in the region, can be found in Fukui! Yoroppaken has been around for over 90 years and that makes it a place not to be missed if you are in the region. 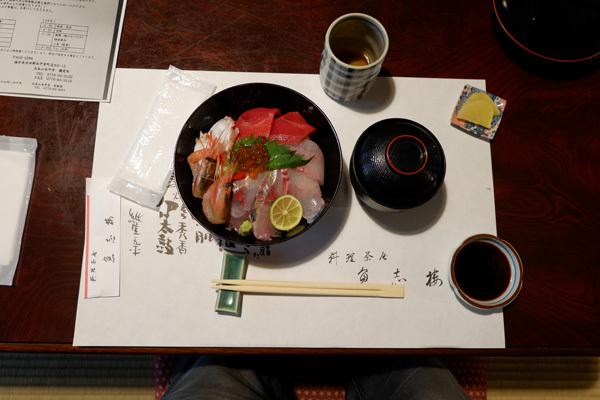 If you don't speak Japanese, there's no problem, the restaurant offers an English menu with photographs. 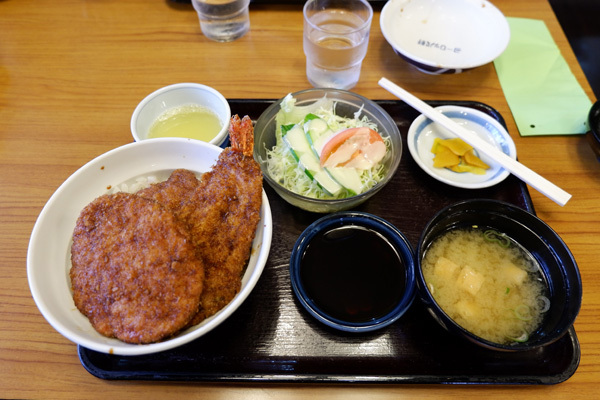 Katsudon is a deliciously breaded juicy pork chops on a bed of rice. The sauce for seasoning the pork is too good. 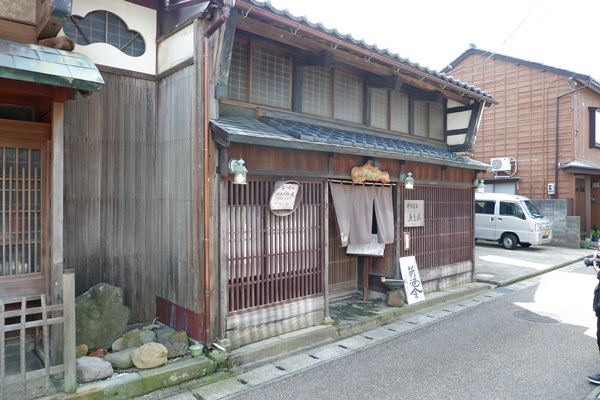 The history of Yokokan goes back to the Edo period. 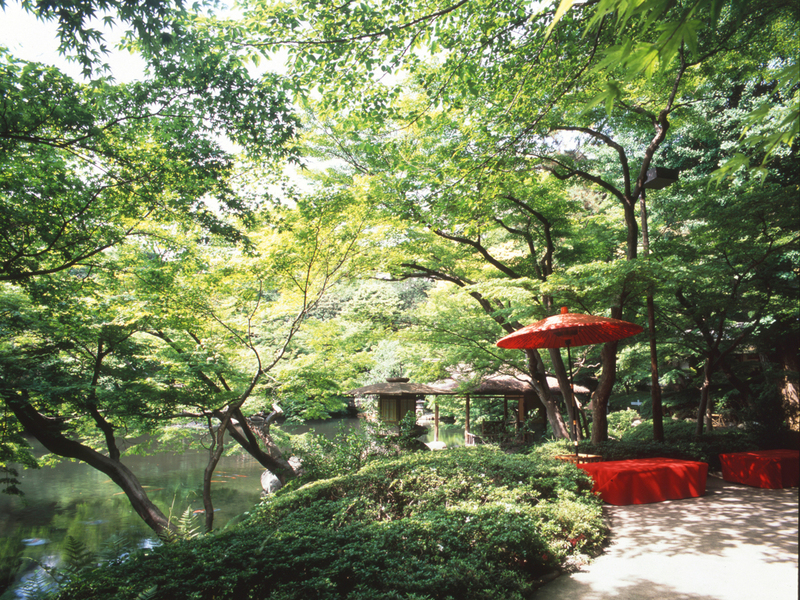 It is a perfect peaceful place to rest, with many maples reddening in Autumn. In addition, there is a small pond in its centre with well-arranged stones that represents a miniature version of a large lake surrounded by mountains. 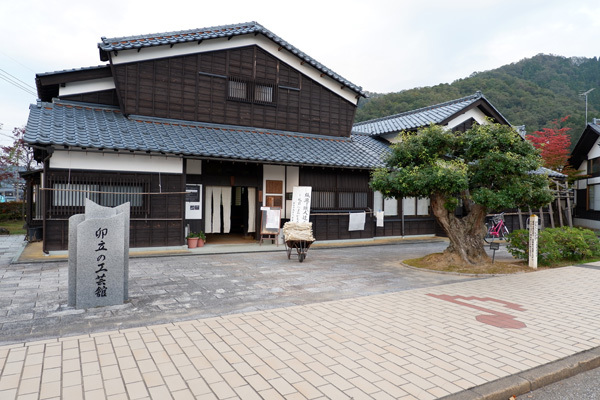 The Municipal Museum of Local History of Fukui traces the history of the city from prehistory to the 20th century. We saw the damage caused by the bombings of the Second World War, and the earthquake that followed a few months later during the reconstruction of the city. 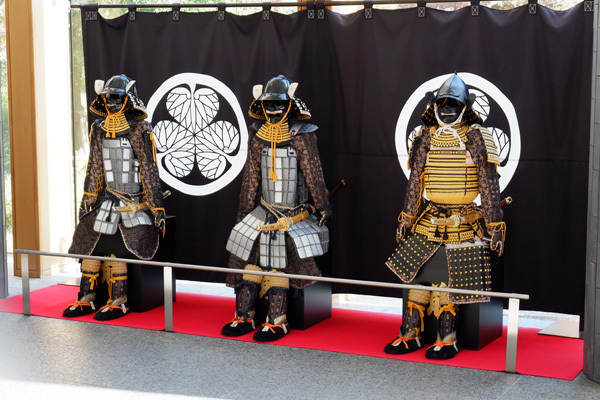 There is something to learn over two levels about the past of this city which was once the home of the Daimyo Matsudaira, a descendant of Tokugawa Ieyasu. We had lunch in a Japanese restaurant of European inspiration. A rather popular place where businessmen, tourists, students and others all gathered. The dish I chose was very good, spiced up by the in-house secret sauce used to season the food. 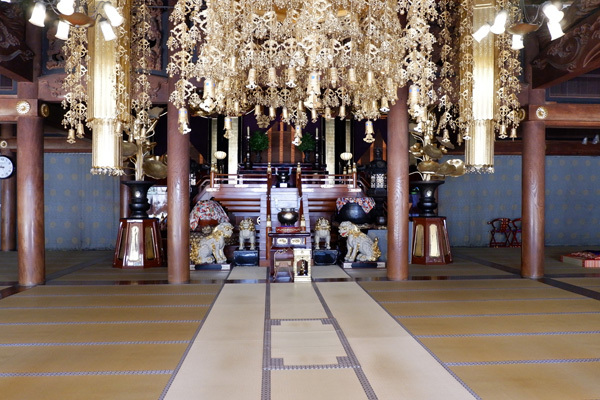 This is a shrine dedicated to Kawakami Gozen, the paper goddess. 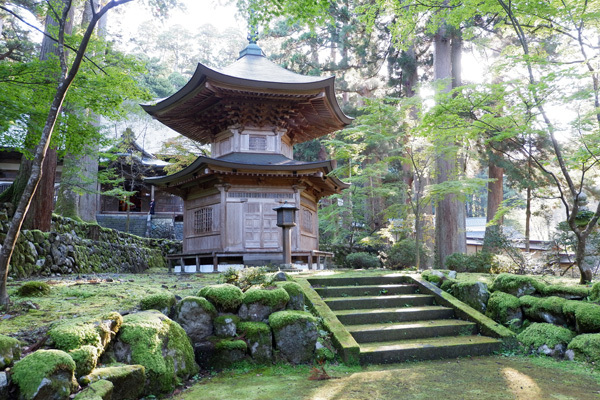 The site, surrounded by beautiful cedars and ginkgos, is a peaceful and spiritual place. 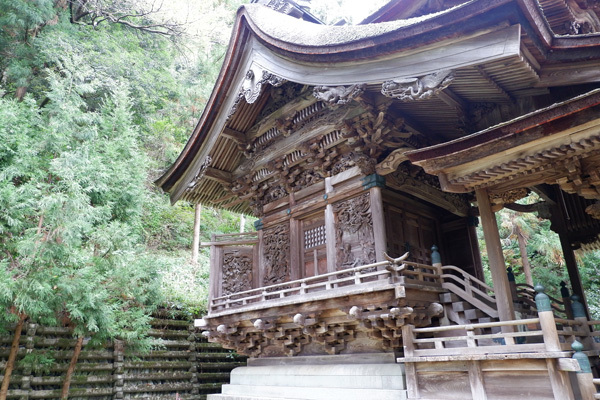 The all-wood building is carved with great delicacy, there are many beautiful details to be seen on this shrine. 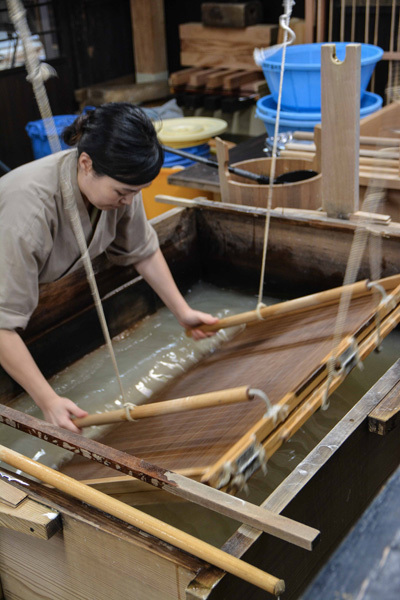 Washi is a very popular craft in Japan and particularly in Echizen. 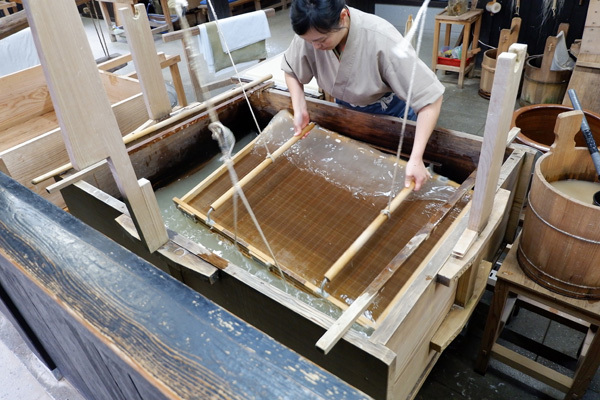 Being appreciate of crafts, it was a real pleasure to understand the steps and delicate process of Japanese paper making at the Udatsu Paper & Craft Museum. We were even able to try making washi and we quickly understood that it was very complicated, and that practice and repetition of the gestures were essential to make an exceptional paper! 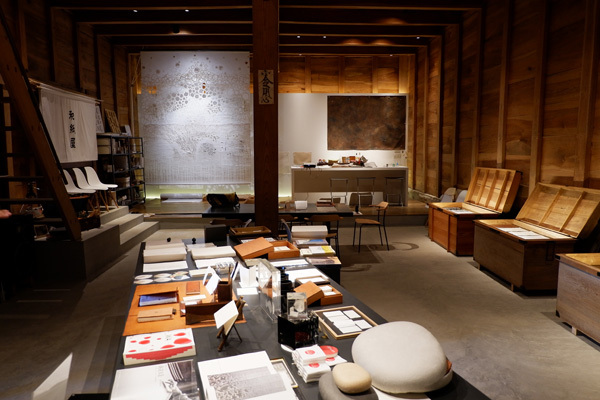 We went to the gallery of a famous Washi merchant, Mr. Yoshinao SUGIHARA. After a tour of this magnificent gallery, we were offered a cup of tea and were told more about this craft and the creations made on behalf of famous buyers from all over the world. 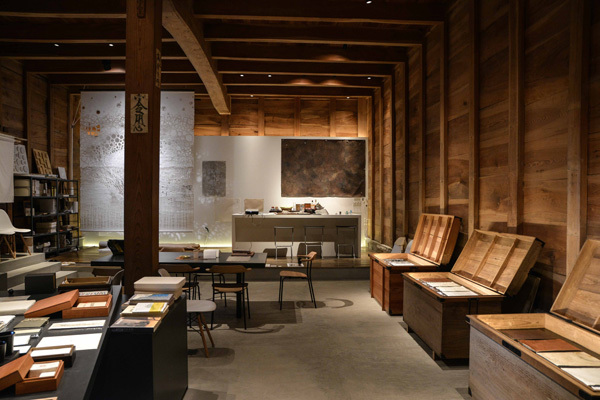 It was a great pleasure to listen to the history, the creations, and to discover the origins of Washi, born in Japan in Echizen nearly 1500 years ago. 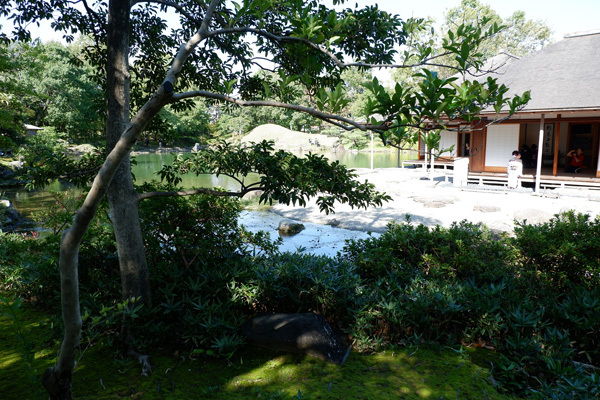 Okamoto Shinto Shrine is a quiet and extremely well looked after spot where you can relax. 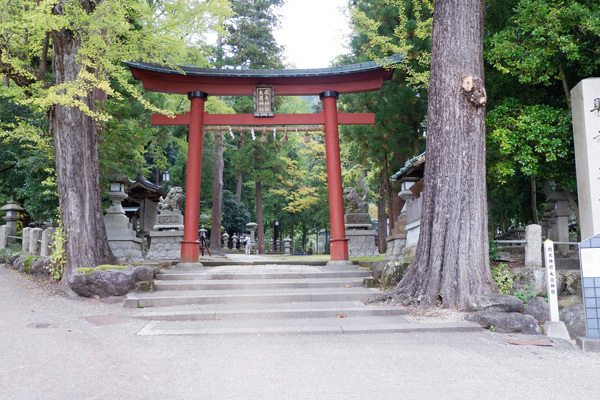 The access is through a majestic Torii from the small street, the main building is decorated with magnificent sculptures in its panels, moss is present everywhere and gives it a very pleasant atmosphere. 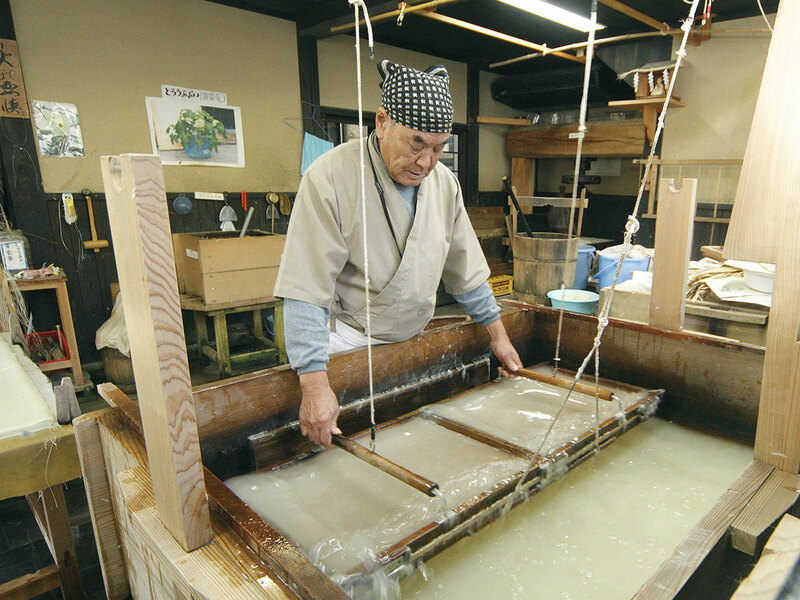 After receiving a complete explanation of the washi paper making process, I was myself able to experiment by making a sheet of paper using ancestral techniques. The tools that are used to make paper are simple. I may have learned the hand movement techniques, but my paper was still far from perfect. 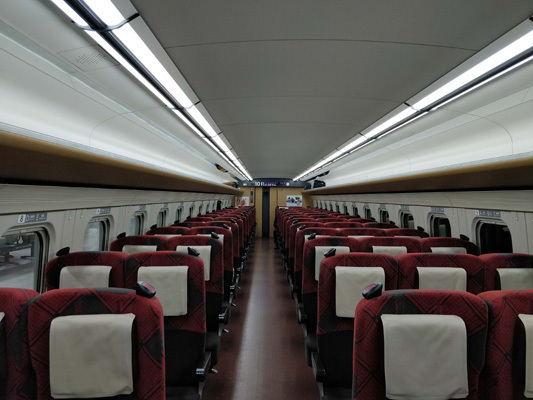 It is always a real pleasure to travel on Japanese trains. 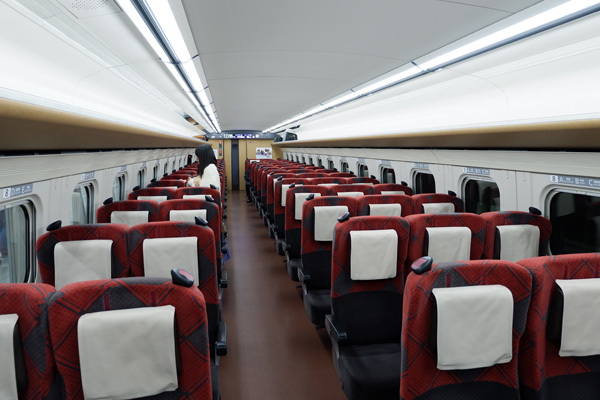 Whether in the Thunderbird to reach Kanazawa from Takefu city in Fukui Prefecture or in the Hokuriku Shinkansen to return to Tokyo, the service, comfort on board and punctuality are exemplary. 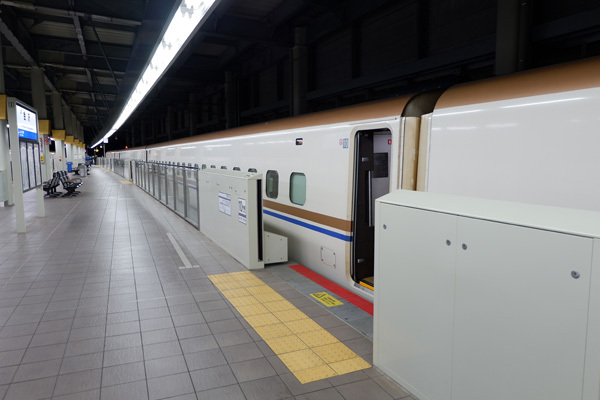 We took the Thunderbird Express train to Kanazawa, then the Hokuriku Shinkansen to Tokyo. The trains were comfortable and quiet, with a tray built in the seat, an electric plug, and a luggage rack above. Of course, the train was on time. 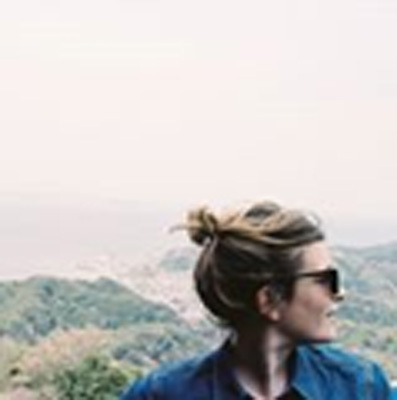 This program has shown me once again that Japan is a very rich country: from the great city of Tokyo, to the temple nestled in the mountains, to crafts in all its forms in the Fukui region, all of them ultimately quite close to Tokyo. I want to share with my community everything I saw during this trip. 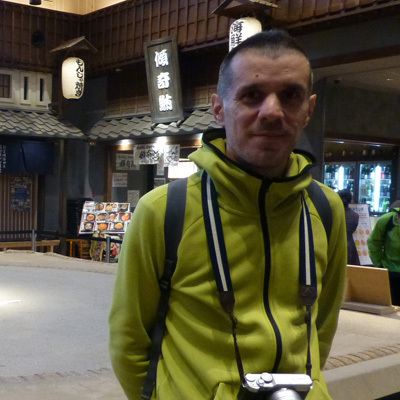 Discovering the region of Fukui was a memorable experience. Everyone was friendly, it was fun, the Japanese style service is really of a unique and exceptional quality. As there are still many places to see, this is a region I really want to go back to. You can travel there by plane or train from Tokyo. For those in a hurry, the plane will be faster, offering more time on site. For the JR PASS holders, it will take a little less than 4 hours but with the advantage of arriving directly in the city centre. The first day in Tokyo allowed me to reconnect with this city that I love so much. 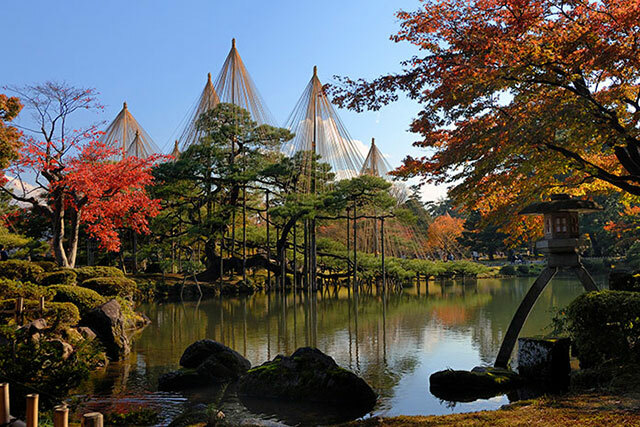 The Fukui region, only an hour from Kanazawa, is well worth a detour to discover a whole section of traditional Japan. I loved discovering this region. The organization was perfect! I was very pleased with the organization of this tour, and also with the people I met along the way. The selected visits were very well chosen, and the time devoted to each of them was perfectly balanced. 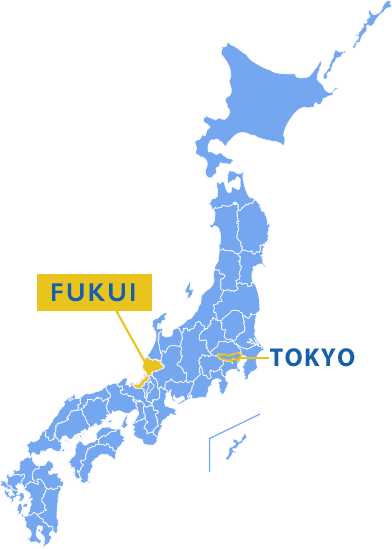 The common theme of all the visits to both Tokyo and Fukui was to showcase the main cultural attractions of these locations and it was overall both consistent and varied in its form with unique experiences each time.